The National Chairman, All Progressives Congress (APC), Comrade Adams Oshiomhole, has described Ekiti governor Ayo Fayase as a “poor student of struggle’’. “Fayose abuses everybody. 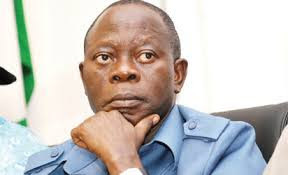 He is a typical armed robber who diverts attention of the police in order to escape,’’ Oshiomhole said on Tuesday at the grand rally for Mr Kayode Feyemi, the APC governorship candidate of APC. He said Fayose ‘s payment of road transport workers to park their vehicles to make it difficult for people to attend APC’s rally, is an indication that he has resorted to primitive tactics. “Fayose also gave an unlawful order asking all shops and markets to close today. Has also called workers to monitor workers’ vote to know who is voting for APC. He assured the people not to be intimidated and “no one can intimidate you. Remember you are educated more than the man who is trying to manipulate you,’’ he said. He also described the alliance of opposition on the platform of CUPP as “an alliance of lies’’. He explained that President Muhammadu Buhari was a democrat and a progressive who would not intimidate anyone irrespective of the divide unlike Peoples Democratic Party (PDP) which prevented the opposition APC memebers from joining the campaign of Fayemi in 2014. “Around this time four years ago, PDP was going to make sure I did not come to Ekiti to campaign. I was denied movement. He said Fayose brought poverty to the people of Ekiti, He has pauperised the people. The workers are not paid and so cannot pay their rents nor go to the market.